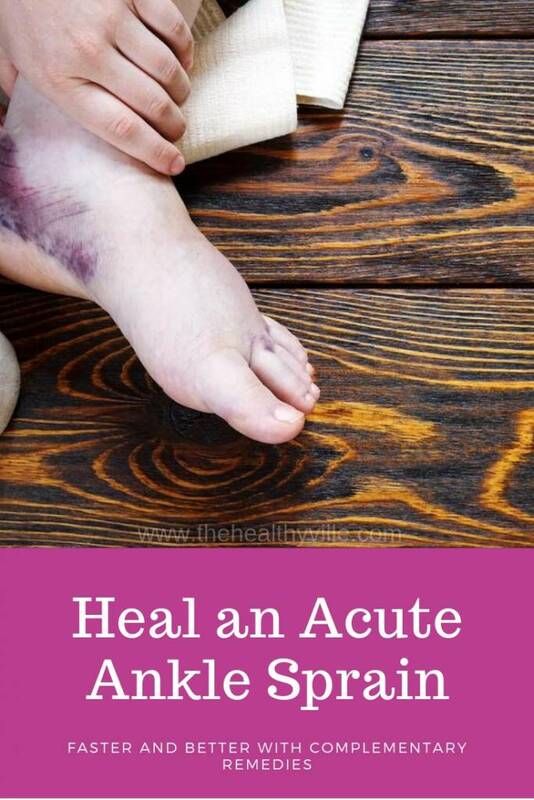 An acute ankle sprain can be a real nightmare. In addition to the treatment your doctor recommends, use these complementary remedies for a faster and better recovery. A sprain can occur anywhere in the body, although the ankle is the most vulnerable spot of the body. It is there where usually this type of contusions is registered, that without a suitable treatment they can be damaged for a long time. An acute ankle sprain is a twist that can happen to anyone, caused by sudden movements when running, walking, improper heating or errors when exercising. An alternative is to improve an acute ankle sprain with natural remedies complementary to medical treatment. The first symptom of a distension of the ankle is a strong pain. This happens because the ligaments suffer a stretch that could even damage the joint. A badly healed sprain can, over time, generate other consequences. Combining rest with soft exercises will improve the circulation of the ankle and its subsequent healing. After a strain of ligaments, the first thing is to avoid resting your foot on the ground, so you should immobilize as much as possible. It is advisable to release it from any type of pressure and use crutches before attempting to walk. A sprained ankle should not be taken lightly, since it could be something serious that delays its cure. The first thing to keep in mind is to rest. In addition, the leg should be raised to the height of the heart to reduce inflammation and pain. Another recommendation is to move the toes, which will facilitate recovery and reduce inflammation. Gentle stretching is also recommended, so the ankle will improve circulation. Among the treatments that exist to cure a sprained ankle are natural remedies, complementary to those prescribed by a doctor. If the injury is mild, it can be treated at home using some easy-to-prepare and easy-to-apply remedies. If, on the contrary, the sprain presents a greater degree of complication, the ideal is to go to a specialist traumatologist to treat the condition. Ice reduces the inflammation caused and the sensation of pain to improve a sprained ankle. Among the home remedies that are known to improve a sprain are the treatments with ice. At the time of the twist, an ice pack or gel is placed to lower the swelling. They can be repeated in sessions of 15 or 20 minutes, every three or four hours for a week, this will depend on the evolution of the injury and the pain produced. However, it should never be applied directly on the skin to avoid burns from the cold. Another excellent option is magnesium sulfate. It is diluted in a cup of hot water of medium size. Once a warm temperature is obtained, the injured foot is introduced for 30 minutes, twice a day, for three or four continuous days. Some essential oils are useful for their anti-inflammatory and analgesic effects. To improve a sprained ankle, and relieve the pain and inflammation it causes, natural oils are excellent alternatives. They are complementary remedies that help to reduce the ailment, acting as an anti-inflammatory, analgesic and muscle relaxant. You can find the natural oils of castor, coconut, garlic, onion, turmeric, arnica or olive, which are placed in the area with a bandage and left to act for at least half an hour. The application must be done during the day and maintained for up to a week. Its use will depend on the progressive progress of the injury. It is important to know how to apply bandages, they are used to keep the area of ​​the foot, fingers and ankles fixed, up to the knee. They should never exert pressure, given the importance of good circulation. The turmeric powder is mixed with lemon. Once the thick paste is obtained it is placed in the hit area. It can also be taken with a glass of milk, twice a day to relieve pain. The onion is cut into pieces and salt is added to make a soft paste. This preparation is fixed with a bandage to the affected area and left to act for two hours. It can be repeated as many times as necessary to maximize its anti-inflammatory effect. Further info: Facial Hair Removal Using Turmeric – Completely Natural And Safe Way! The arnica has anti-inflammatory effects to improve a sprained ankle and any joint. Arnica is a plant that is prepared in oil to reduce the inflammation of bruises. Drops are placed on the affected part of the foot, massaged and left to rest for about five hours. The olive oil can be mixed with an egg yolk and placed in the injured area. The ointment is covered with cotton and covered with a bandage, leaving to act for two days. Another possibility is to place several drops of this oil previously heated in the affected area. Massage gently, a practice that can be repeated up to four times a day. If you learn how to improve an acute ankle sprain using complementary natural remedies you will achieve a faster recovery. Using them in the affected areas is simple, economical, but above all very effective. As long as you combine it with the treatments your doctor recommends. Don’t forget to SHARE how to treat an acute ankle sprain with your friends and family on your social networks!